The stainless steel kMix Hand Blender HB898 The stainless steel kMix Triblade HB898 hand blender offers functionality with a design flair, with powerful and controlling blending at the touch of a button. Performance Featuring a 380W motor, Kenwood's revolutionary Triblade technology and five blending speeds, the raspberry (red) kMix Hand Blender will always give you fast, controllable blending performance. This hand blender comes with a processor bowl attachment, stainless steel reversible slicing/shredding disc and chopping blades. The Soup XL pan blender is perfect for creating delicious soups directly in the saucepan. There's also a durable stainless steel balloon whisk for whipping up creams and desserts. Design for life the high quality die-cast aluminium body and durable stainless steel blades of this hand blender assures quality results time after time. And when it's not in use, it will add a splash of retro styling to your worktop. Brand Description KENWOOD Dimensions 23.5L x 24.0W x 35.5H cm Dishwasher Safe Yes Material Stainless steel Stainless Steel Blade Yes Wattage 380W Weight 3.1kg. 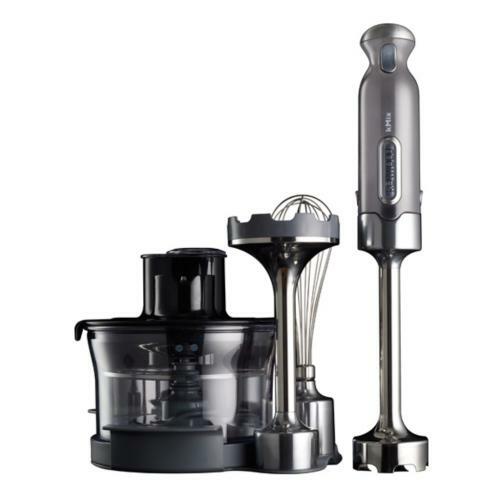 Masterfully built with a unique tri-blade design, Kenwood’s KMix hand blender delivers powerful and efficient chopping and more all at the touch of a button.